"The Age of Innocence is unmistakably Scorsese, with gossip instead of guns." For "Departures," a regular feature on the new film site The Dissolve, Scott Tobias writes about Martin Scorsese's 1993 adaptation of the Edith Wharton classic, which turns 20 this year. "It’s hard to compare the New York of "The Age Of Innocence" to the savage criminal underworlds of Scorseseland a century later, but only because the kills here don’t stain the hardwood. But Newland is rubbed out just as surely as the pileup of gangsters in "Goodfellas" — to a point, he’s responsible for pulling the trigger — and for the same reason: With the world outside threatening change, the mobs in both films have to close rank to survive. Scorsese is an expert of registering the human consequences for those who disobey the rules, or in Newland’s case, have their desires extinguished. "The Age Of Innocence" possesses a tension between the flowering of private passion and the quiet forces that make its survival impossible — and Scorsese, a master of coiled intensity, brings it across with heartbreaking force." "L.A. County grants aim to boost jobs as well as artistry." By Mike Boehm, for the Los Angeles Times' "Culture Monster" blog. Forward this one to all your creative friends in La La Land. "Los Angeles County arts grants -- the most recent round was announced this week -- aim to boost the economy as well as sweeten the county's cultural offerings. Laura Zucker, the Arts Commission's executive director, said more than 25% of the $4.318 million in grant money will help the nonprofit organizations that receive the aid pay their staffs, helping local employment while also fostering the arts. The grants are for two years each; the average total is $22,258, down slightly from 2011, the last year in which the current crop of recipients was eligible. The commission spread the wealth a bit more widely, issuing 194 grants, compared with 184 two years ago." 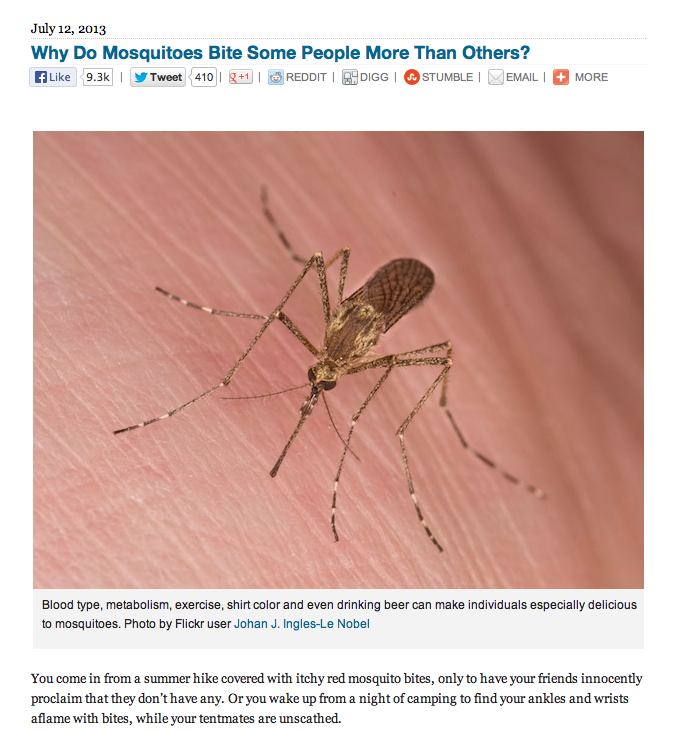 "Why Do Mosquitoes Bite Some People More Than Others?" By Joseph Stromberg, for Smithsonian Magazine. As the TV news folks say, The answer....may surprise you. "An estimated 20 percent of people, it turns out, are especially delicious for mosquitoes, and get bit more often on a consistent basis. And while scientists don’t yet have a cure for the ailment, other than preventing bites with insect repellent (which, we’ve recently discovered, some mosquitoes can become immune to over time), they do have a number of ideas regarding why some of us are more prone to bites than others. Here are some of the factors that could play a role." 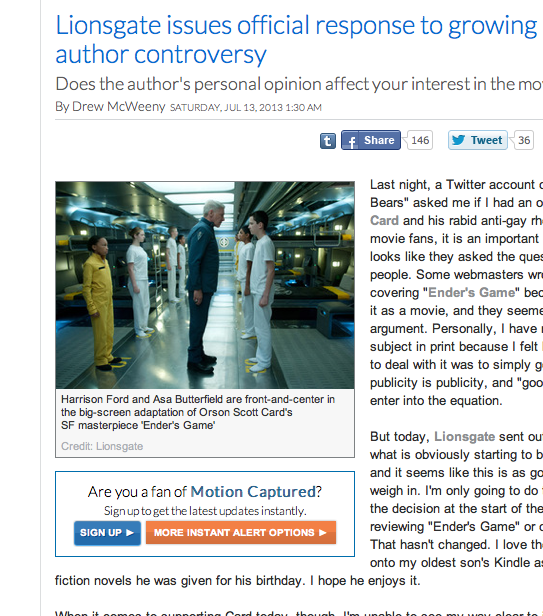 Drew McWeeny, film critic for HitFix.com, does not urge a boycott of "Ender's Game," but still says he's decided not to see the film, because he doesn't want to support the efforts of novelist Orson Scott Card to deprive gay, lesbian, bisexual and transgendered people of their rights. "What really got me this past week was how he is now asking people to show him tolerance, as if he has been victimized. He's acting like the battle over gay marriage is done and finished and it's all fine with him now, but I don't believe this new stance of his. He's been too angry, too scathing about it in the past, and the comments he's made are so uninformed that I find it hard to believe he's written the books he's written. He called gay rights a 'collective delusion' at one point, and laughed at the idea that there's any similarity between the battle for civil rights based on race and the same struggle for people defined by their sexuality. He considers LBGT people to be indulging in 'deviant behavior.' He simply doesn't believe that gay people should be protected under the law and has said so in quite stark terms. He genuinely believes that they harm society simply by existing, and that no homosexual is ever genuinely happy. He's so off-base that it's startling, and over the years, he's dug in harder and harder on the subject." 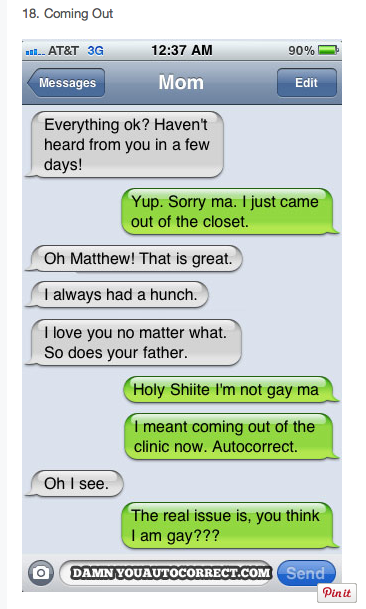 How can you not want to read "The 25 Funniest Autocorrects of the Year"? "Finding the Quiet City." An interactive map from The New York Times showing spots in the five boroughs where one can go for peace of mind. Not too many dots on that map, as it turns out. Click here for the full report. The full trailer for the Japanese remake of "Unforgiven," starring Ken Wantanabe as a samurai in the mode of Clint Eastwood's grizzled western gunfighter. Thanks to Twitchfilm for the tip.